A copy of the summer 2014 ACTE Newsletter. 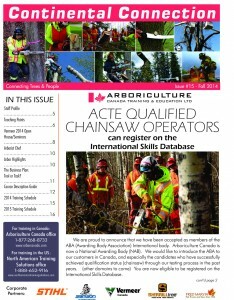 Arboriculture Canada partners with North American Training Solutions, CORE Ergonomics and the Good Rigging Device System at the TCIA Expo Exhibit. November fifth to the seventh found NATS/ACTE trainers advancing the knowledge of safe arboriculture at the Tree Care Industry (TCI) Expo in Baltimore, Maryland USA. Billed as the largest tree care industry trade show thousands of arborists gathered for three days of networking, presentations, education and comradeship. Combining the skills and knowledge of an eclectic set of tree work professionals, trainers and cutting-edge industry innovators, NATS/ACTE formed an epicenter of education and information in one booth on the trade show floor. Joining forces with C.O.R.E Ergonomic Solutions and Good Rigging LLC an aggressive program of arborist skills was displayed and taught. A cadre of fluorescent yellow shirted instructors actively engaged each other and passersby in any number of tree care topics. The Good Rigging Control System (GRCS) was on constant display lowering and raising rounds of wood. This ingenious device allows an arborist to render any job requiring large loads to be lowered with unparalleled finesse and control. To those interested, various tips and techniques were readily available to unlock the full potential of the GRCS. Numerous climbing lines hung from the rafters and the staging framework as climbing and rigging scenarios were discussed. Knots were taught. Systems were rehashed. Stories and exploits were told and retold. 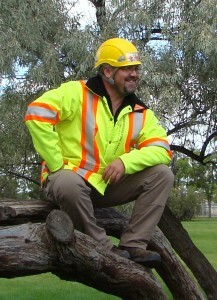 Many tree care providers work in retaliative industry isolation. Magazines and catalogs are often the only avenue for them to increase their knowledge. The NATS/ACTE booth allowed many climbers and ground workers a chance to see and interact with the new tools and techniques of arboriculture first hand. This invaluable interaction is a great source of learning for both student and teacher alike. Splices were viewed and demonstrated. Due to some generous donations by our sponsors many spliced slings, split tails and lines were given away. Often the person on the receiving end had first-hand experience in seeing and making the splices him or herself. This comprehensive, entreating look into the necromancy of cordage splicing was eye opening and informative. Members of C.O.R.E Ergonomic solutions discussed proper work practices to prolong careers as well as job related injuries and how to avoid them. Often an Expo attendee would relate the story of an injury and receive accurate, useful information. Work Positioning saddles were often a hot topic for discussion and many walked away with a better understand of how to fit a tool to a worker as opposed to fitting a worker to a tool. This is the very basis of proper ergonomics and a driving force behind C.O.R.E’s mission. As a supplement to the full line of activities and information exchange going on at the booth, various NATS/ACTE instructors presented to the Expo as a whole on the trade show floor’s main stage and in separate scheduled seminars. Topics ranging from hazard and danger tree cutting, to pruning for wildlife habitat enhancement, aerial rescue and ergonomics were covered in detail. Lively question and answer sessions ensued during and after the presentations and much was learned by all. More than the standard “generic” info was covered. 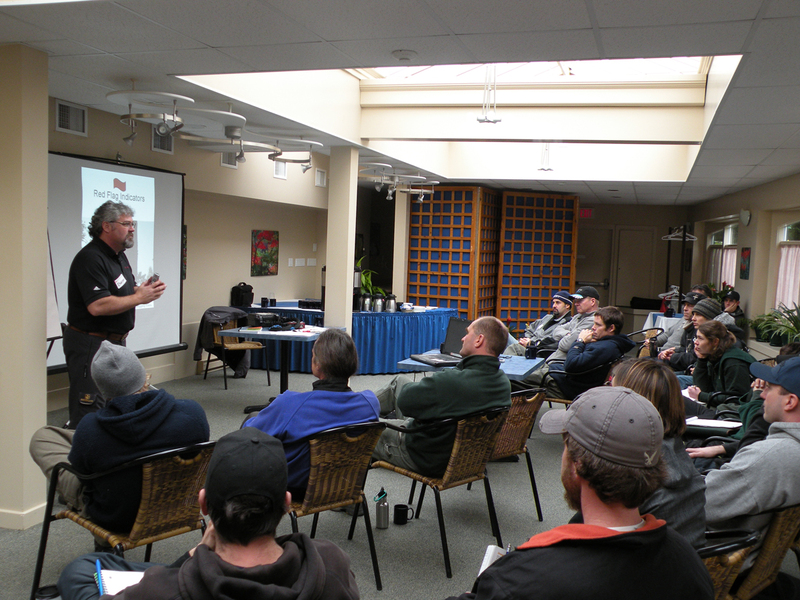 Attendees took home real, relevant information and skills to practice and use on the job site. After a tiring three days, much fun, friendship and information was shared and gathered. New ideas were born. Old ones were refined with new understanding. The combined skills of all made for an atmosphere of fun and challenge that has developed into the hallmark of all our training programs. The array of tools, techniques and desire were finely aligned with education, inspiration and competence. Anywhere these can be found working together is bound to be a success. If you saw us there, thank you for your time and attention – we anxiously await the next opportunity to serve, support and share with you. If you could not make it, it we hope to see you in the future whether it be at the TCI Expo or any of our training programs in Canada or the United States. We are proud to have provided training services for so many businesses over the years, many of whom have been with us from the very start in 1999 and we don’t take it for granted. If you are interested in learning more about the vast amount of services and solutions we provide for any of the clients below, please don’t hesitate to contact us. The Butchart Gardens ULS Landscaping & Mntn. Olds College School District #45 West Vanc. Niagara Peninsula Cons. Auth. Grand River Cons. Auth. St Catharines G&CC Penticton G&CC. The following have attended training programs that are being delivered for municipal arborists, in order to collaborate with emergency rescue protocol. Woodbine Entertainment Green Acres Landscaping Ltd.
Sheppard Landscaping PWL Partnership Landscape Architects Inc.
Posted in Continental Connection Newsletter, Winter Issue 2010 | Comments Off on Get Connected! For over 10 years, our partners, staff, colleagues and I have continued to forge an idea or concept in the area of tree care. This concept is that training, and education for tree workers is important for the safety of the workers and the preservation of trees. Training has always been an important aspect of any successful organization. 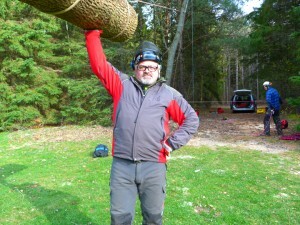 Historical evidence shows that training tree workers has been going on almost since the very beginning in North America and long before that in Europe and other parts of the world. People seem to have a connection to trees that is almost inexplicable and for some of us this connection causes us to become arborists and to dedicate our lives to the care and preservation of trees, making it our livelihood. In a recent television interview, where I answered questions pertaining to a colleague who won an international award last year at the ISA show in Providence, I answered questions that made me seriously stop and ponder why I do what I do as a profession. I realized why I have chosen this business of arboriculture education for long over a decade and why I have worked as an arborist for over two decades. It is because I love to train and educate others to understand trees and safely and properly care for them. Many friends of mine have said that understanding how a tree grows and functions is the first step in understanding how to care for it. The same premise holds true for so many aspects of tree care. Climbing and rigging is much safer and easier if all involved with the job at hand understand various concepts of physics. A basic knowledge and grounding in the science of physics goes a long way to improving safety, productivity and longevity. Using a chainsaw and felling trees is another major aspect of tree work that overlaps into many other trades. Understanding how a chainsaw cuts and the reactive forces created are other examples where training and education will make a big difference in the areas of safety and productivity. So often in these busy times as new staff come and go, time may not be invested on why to do a task a certain way, but rather focus is only put into how the task should be performed. Workers that do not understand the reasons and concepts behind performance criteria required of them will show results of boredom, accidents, and no-shows. We call this, ‘training without education’. As a result, many employers and business owners face a decision of whether to invest in a person who may or may not remain in their employee long term. 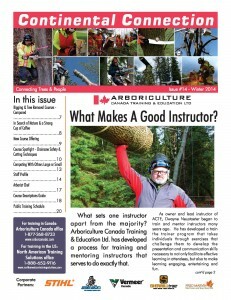 ArborCanada’s approach to connecting training and education with respect and enjoyment is one of the secrets to our success. In open enrollment courses, where attendees come from all around and take a general course, or in focused programs customized for a specific clients work activities, ArborCanada training and education creates a win-win investment in a short time. 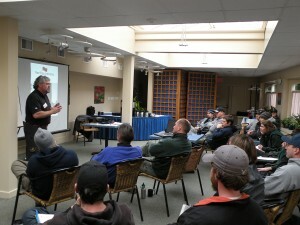 In one or two day’s attendees are inspired, trained and educated. They have fun and learn more, faster. Many times attendees of our programs leave motivated and inspired to stay with arboriculture a while, several years or a lifetime. In my case, this type of investment set my career path. Attendees from our programs and past customers have experienced this to be true many times, not just because our curriculum is current and relevant and our instructors are leaders in arboriculture in many respects, but because we are doing what we love and are passionate about. In fact, anyone who pursues their heart and passion is destined to succeed. Many of us understand this well and have inspired and motivated others to stay in the tree business because of it. 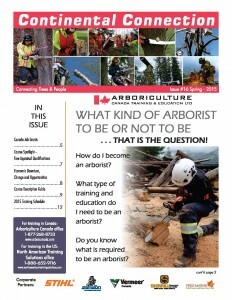 We at Arboriculture Canada Training and Education – from registration, workbook production, certificate generation, data entry, web design, our corporate partners, assistants and instructors – are passionate people doing what we love -because we choose to. Thank-you to our customers who come back to us for training year after year and to everyone who chooses to work with us and support us. We look forward to seeing all of our old friends in 2010 and meeting many new ones.